Rate this project Following several delays during the development cycle, the Mageia project has announced the release of Mageia 6. The new version includes the KDE Plasma 5 desktop environment, the DNF package manager is now available alongside urpmi and Mageia 6 includes live test media for the Xfce desktop environment: "The extra time that has gone into this release has allowed for many exciting additions, here are a few of the major additions and key features of Mageia 6: KDE Plasma 5 replaces the previous KDE SC 4 desktop environment. The new package manager DNF is provided as an alternative to urpmi, enabling a great packaging ecosystem: Support for AppStream and thus GNOME Software and Plasma Discover; support for Fedora COPR and openSUSE Build Service to provide third-party packages for Mageia 6 and later; dnfdragora, a new GUI tool for package management inspired from rpmdrake. Brand new icon theme for all Mageia tools, notably the Mageia Control Center. Successful integration of the ARM port (ARMv5 and ARMv7) in the build system, allowing to setup ARM chroots. Installation images are not available yet but will come in the future. GRUB2 as the default bootloader. 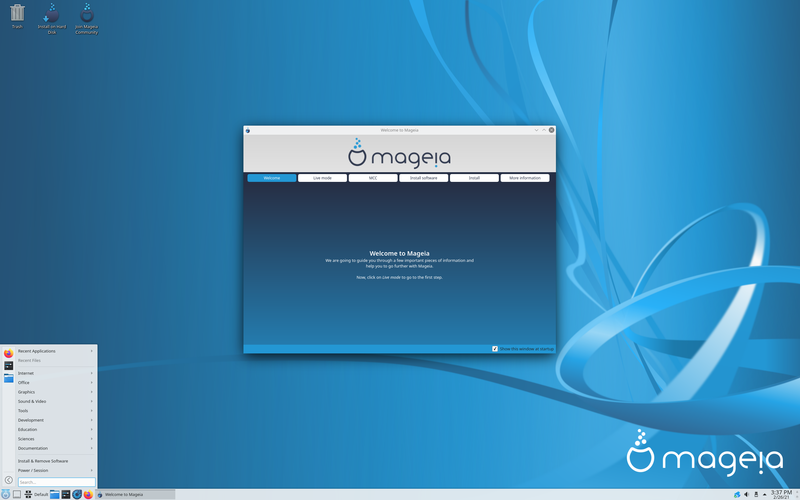 New Xfce Live images to test Mageia with a lighter weight environment." Additional information on Mageia 6 can be found in the project's release announcement and in the release notes. Download (pkglist): Mageia-6-LiveDVD-Plasma-x86_64-DVD.iso (2,505MB, SHA512, signature, torrent), Mageia-6-LiveDVD-GNOME-x86_64-DVD.iso (2,072MB, SHA512, signature, torrent), Mageia-6-LiveDVD-Xfce-x86_64-DVD.iso (1,915MB, SHA512, signature, torrent). Also available from OSDisc. Donald Stewart has announced the release of Mageia's new development snapshot, Mageia 7 Beta 3. This is expected to be the final beta version prior to the release of Mageia 7. "There is still lots to be done before the final release, and the more tests that we can get, the better. There have been large updates to Qt and Plasma, as well as some other key components since beta 2, with the new artwork for Mageia 7 almost ready for integration too. The ISOs will be available to download directly, and by torrent here. Here are a few release highlights and package versions: kernel 5.0.7, rpm 4.14.2, Plasma 5.15.4, GNOME 3.32, Xfce 4.12, Firefox 66, Chromium 73, LibreOffice 6.2.2." Further information on the beta snapshot can be found in Mageia's release announcement and in the more detailed release notes. Download (pkglist): Mageia-7-beta3-x86_64.iso (4,249MB, SHA512, signature, torrent), Mageia-Cauldron-netinstall-nonfree-x86_64.iso (80MB, SHA512).